Broad Street Markets have a very long history. The Pipe Roll of the Bishop of Winchester, 1210-11, contains reference to the 'Forum de Alresford', or in plainer words, Alresford Market. The man responsible for establishing the market in the town was Geoffrey de Lucy who was consecrated Bishop of Winchester in 1189. As part of his plan to improve trade between Alresford and Winchester , he had the centre of the town of New Alresford demolished and remodelled in the T-shaped form that still exists today. The very width of Broad Street suggests that it may have been specifically designed as a market place. The Bishop would have had a very good reason for doing so, and that reason would have been economic rather than spiritual or philanthropic. By building up the trade between the two towns at his own expense, the Bishop was rewarded by a charter from King John. The Bishop and his successors had the right to collect all fines, taxes, customs and tolls from the trade up and down the River Itchen. It would have been in Geoffrey de Lucy's economic interests to provide Alresford with a street wide enough to hold a large market. In the thirteenth century there was a market house at the top end of the street, near where the church now stands. It was next to a 'shambles' where animals were butchered and slaughtered. There were probably fish stalls, almost certainly selling eels caught on the River Alre or in the Alresford Pond. Cheese and bacon would, most likely, have featured as products for sale as would parchment made from sheepskin. The ringing of a bell started the selling process. Traders were in trouble if they started to peddle their wares before the bell tolled. In 1572 Alresford's status as a free borough, and entitled to its own Corporation, was confirmed in writing by the Bishop of Winchester. Times were hard, poverty was rife and the markets were stagnant. To try to rectify this, the bishop committed the management and the revenues from all markets and fairs to the Town Bailiff and his Burgesses. In this document reference is made to 'a free market to be held every Thursday as of old hath accustomed to be held'. The ' hayward ' was the man who controlled the market traders and collected the rents from the stallholders. These were then passed on to the Bailiff of the Borough, after the deduction of the expenses he had incurred. In 1774, Robert Boyes, Master at Perin's Grammar School, wrote, 'The markets that are held on Thursday, partly through the situation of the place and partly by the re-establishment of the navigation from Winchester to Southampton are become very considerable. In times when there is a free exportation of corn, it is one of the greatest markets in Hampshire for wheat and barley.there are frequently above one hundred loads of wheat sold in a day'. He mentions toys, haberdashery, seed, bread, oats, bacon and cheese amongst the other products at a typical market in Broad Street during his times. This weekly market continued under the auspices of the Bailiff of the town until 1890, when the local government reforms of the 1880's swept away the post of Bailiff. 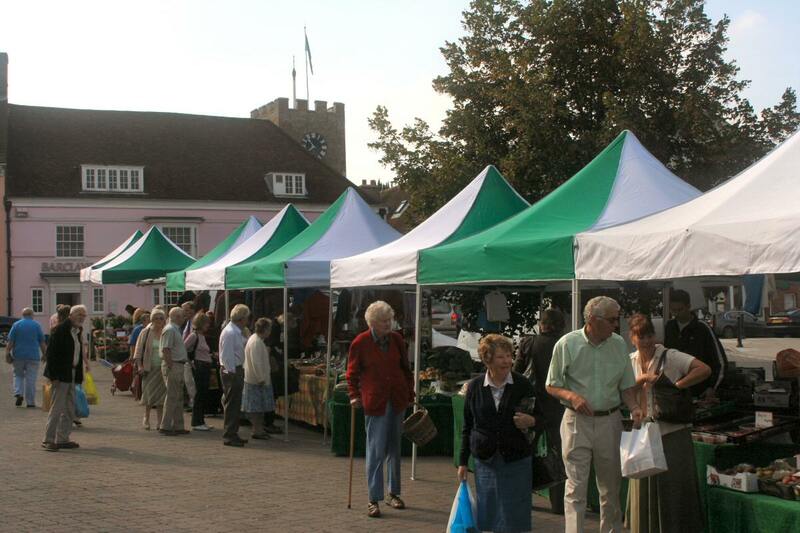 As a direct result of this legislation the New Alresford Town Trust was passed a baton, curled inside which, was the parchment that proclaimed in writing the ancient right to hold a market every Thursday in the town. This charitable organisation still holds those rights today. However there was a longish period when the Town Trustees let this right lapse. In 1937, A.J. Robertson published his book, 'History of Alresford'. Contained therein is a reference to the weekly Thursday market, he almost casually mentions that, 'this was done away with long ago'. 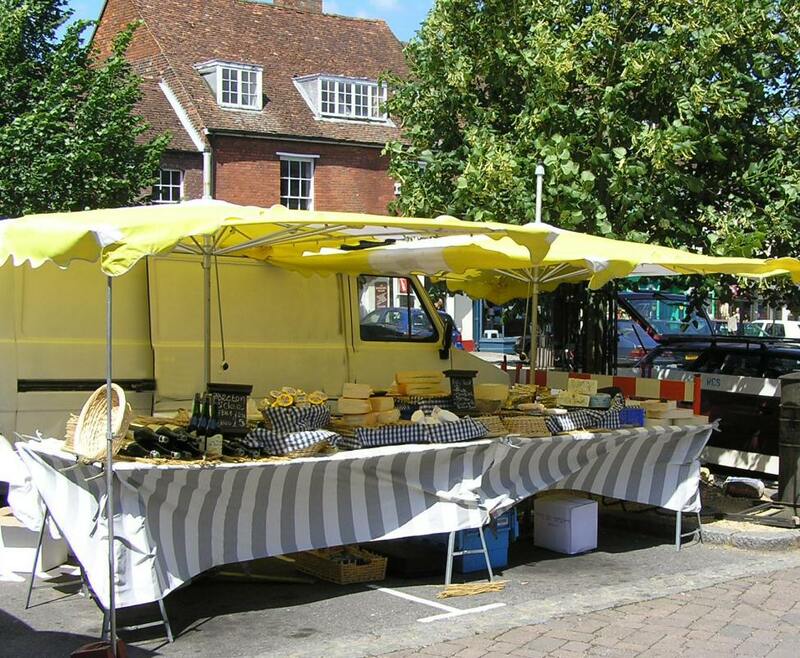 Writing in 1997, in an article called 'Alresford Remembered', Freda Kelsall recalled her time as the first female Chair of the Parish Council in the 1970's, 'there was much excitement when it was discovered that Alresford had rights granted by an ancient charter to hold a weekly market. The custom was revived, across several car parking spaces, and against a short-lived barrage of opposition.' The ancient custom of holding the weekly Thursday market hasn't been allowed to lapse since. 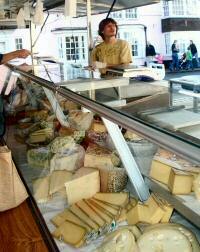 The market held every Thursday is the direct successor to Bishop de Lucy's market. It was re-established in 1975 and, under a traffic regulation order issued by Winchester City Council, has the right to occupy parking bays from the top of the service road down to just beyond Pizza Express. Recently, Winchester City Council has authorised closure of the service road down as far as the George Yard entrance, which will allow market stalls on both sides of the service road in that area and will provide space for up to twenty stall holders. Other old favourites of the Thursday market for the last seven years are Derek Price (Orchard Lea Nursery) who grows all his own herbs, alpines and flower and vegetable plants. 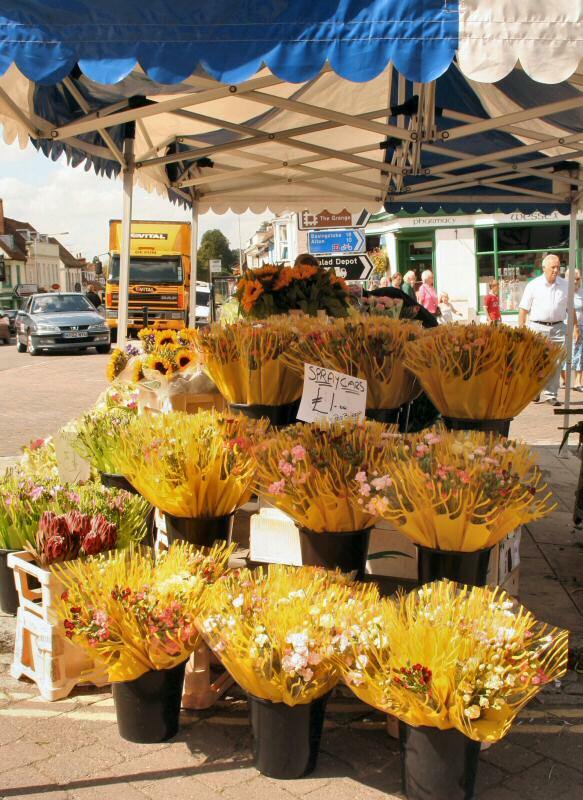 If you wish to know anything about the different markets that are in held in Alresford, please write, phone or email Town Trustee Pam Stevens, 2, Witton Hill, New Alresford, Hampshire SO24 9PT; 01962 734861, heatherhollow@btinternet.com. She will be delighted to hear from you. 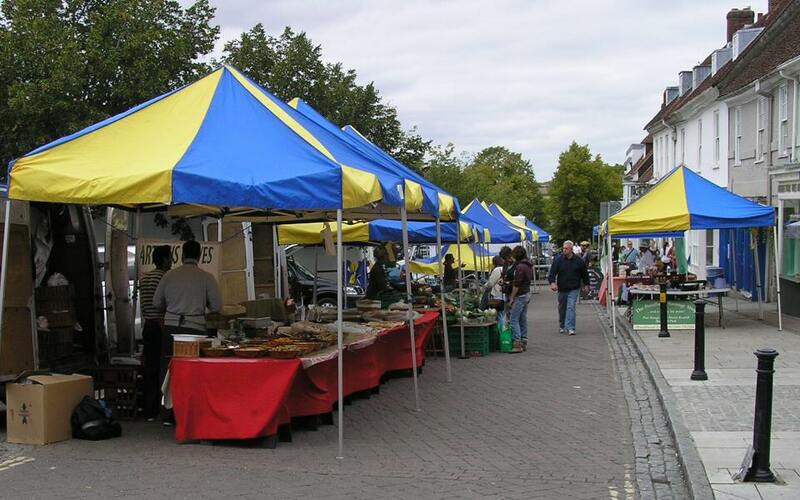 The Town Trust re-introduced the French Market in April 2017 and this will again take place on 20th April 2019. There will also be two Brocante Flea Markets in 2019 one on Bank Holiday 6th May and one on the 15th Spetember. Alresford welcomes the Brocante flea market, already established in Bishops Waltham and Romsey, which should be a very popular event with many enthusiasts as well as traders offering Antiques, Collectables, Vintage, Curios, Bric a Brac, Vinyl records and many quirky ‘finds’ you didn’t know you needed. 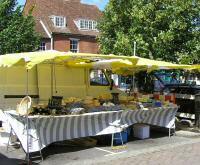 If you are local and have items you wish to sell why not contact the organiser about having a stall/table. This is an ideal opportunity to sort out your lofts and outhouses. There will be about 35-45 stalls to choose from. NB 'Brocante' is french for used or second-hand. There are no plans to introduce an Italian Market at the present time but things may change. Come along. Support your local markets. They have been taking place on Broad Street for at least eight hundred years, maybe even for longer. Please play your part in keeping this ancient right and tradition alive.